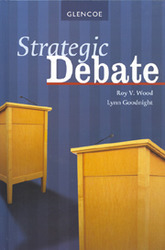 Designed for beginning through intermediate debaters, Strategic Debate features a wide range of activities that challenges your students intellectually, analytically, and verbally. These same activities provide students with opportunities to try out the strategies used by championship debaters. Make your students more cogent, competent debaters with easy-to-understand chapters on flowing and structuring the affirmative and negative cases. Strengthen your students skills and tactics with comprehensive chapters on refutation, rebuttal, and the latest trends in cross-examination. Hone your students understanding of debate and help build character with coverage of the importance of ethics and trends in competitive presentation. Make your students more cogent, competent debaters with easy-to-understand chapters on flowing and structuring the affirmative and negative cases. Strengthen your students’ skills and tactics with comprehensive chapters on refutation, rebuttal, and the latest trends in cross-examination. Hone your students’ understanding of debate and help build character with coverage of the importance of ethics and trends in competitive presentation.